It can be difficult to get some messages across. Some messages people just don’t want to get, because it’s someone else’s problem; none of their business; too hard to fix/deal with; or what the hell can they do? Sometimes those people don’t want to upset their privilege in the skewed status quo. I haven’t checked the legitimacy of this video, but whether it’s real or not, the message is both clear and clever, and presented in the best way (I can think of) for those who need to know about it – the consumer of human trafficking. 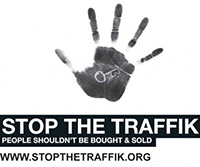 Campaign by STOP THE TRAFFIC.